As an event manager, meeting planner or overall special events coordinator, we all have one common goal – to provide the biggest, the best and most out-of-the-box events to our clients. Most of this comes with experience but a good chunk of it is due to exposure. Our ideas and inspirations come from everywhere. From creating, attending or running an event, to a night on the town with friends and yes, even a good ‘ol lounge session in front of the TV. After all, who would’ve of thought of a lollipop dress as a way to serve dessert, or fishbowl centrepieces? If experience is what you lack, or you’re looking for some fresh new ideas, expose yourself to the following shows and resources to help broaden your creative spark and event knowledge! This three-day event is jam-packed with new ideas, inspiration and affordable solutions for your event planning endeavours. Held at the Metro Toronto Convention Centre from March 25-27, 2014 the CSE Expo provides planners with the tools and resources to make your events POP, all while strengthening your professional network. Whether you’re an experienced event planner or are new to the game, you will definitely want to attend! This year’s expo includes over 50 new vendors, food trucks, and chocolate and ice bar samples. You can even join ISES on the show floor for insights and knowledge from industry experts at no cost! Have a burning tech question? Head to the tech bar to get your questions answered and even bring your own devices! Also, be sure to check out APPSTRAVAGANZA – new for this year, it will introduce innovative and effective online technology with hands-on and guided learning. This expo provides many opportunities and is not to be missed! The Ignite Business Event Expo will be returning to Toronto on April 8th and 9th at the Direct Energy Centre. Attend this event for NEW and exciting inspiration to help your career. Connect with unique suppliers and be sure to check out the experience zones that will help spark and kindle creativity. This expo offers an exciting business environment that sets the stage to perfectly network and connect! Have you heard of IncentiveWorks? Coming up on August 19th and 20th at the Metro Toronto Convention Centre, is Canada’s largest event for planners and organizers! This show gives industry professionals the opportunity to network with vendors, suppliers, speakers and other resources to stay current on what what’s hot and trendy! With a trade show of over 700 local, national and international suppliers in the meetings and events industry, you’re sure to make some meaningful connections! Event planning is a career that is fast and is forever-changing. Trends are as unpredictable as spring in Toronto 2014. Stay relevant by exposing yourself to resources and network to equip you with the tools to be at the forefront of the event industry. As the mercury climbs every summer the need to find a watering hole becomes increasingly more essential. There aren’t many activities that beat grabbing a few cold ones on a patio with some friends, the perfect blend of summer heat and true refreshment. Presumably, you, the reader also enjoy a summer patio session as you are still reading. So, with that confirmed this post will lay out some of Toronto’s most enjoyable patios and will provide you with a Toronto Summer Patio Bucket list. 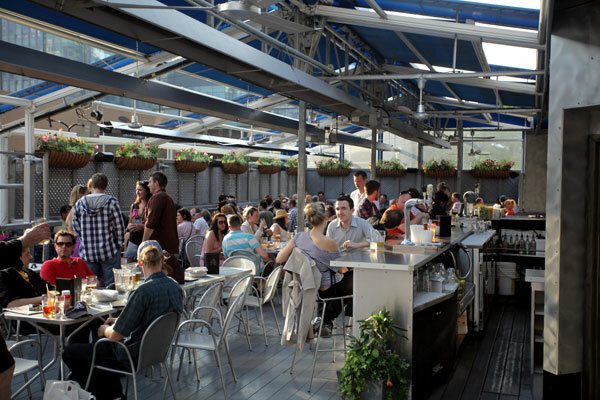 Many of the patios below are also great venues for events and offer a fresh change from a hotel banquet room. The first patio we would suggest visiting is the Cadillac Lounge Patio at 1296 Queen Street West. The Cadillac Lounge has a unique back patio that is rather spacious and is filled with the aroma of their hickory smoker, minus all the smoke of course. It also offers a large variety of bottled beers or on tap. Its retro atmosphere will charm you and travel until the Southern United States. 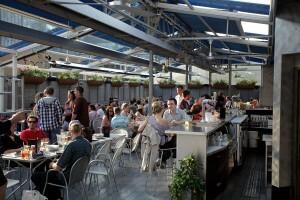 When you think patio in Toronto you immediately think Pilot’s Patio: The Flight Deck! Opened in 1993 as the largest “patio with altitude” in Yorkville, its name came from a tribute to the heroic flyers of World War II. 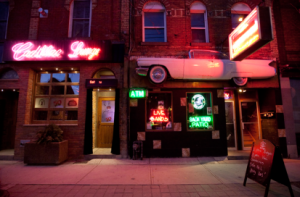 It has been known as an artist bar, then the hub of Toronto’s hippie community, to finally become the place to go for elite’s after work drinks and trendy after midnight party nowadays. Hair of the dog is an upscale neighborhood pub and restaurant on Church St, on the southern fringes of the Gay Village. Hair of the dog reflects the diversity of the neighborhood thanks to a mixed clientele. 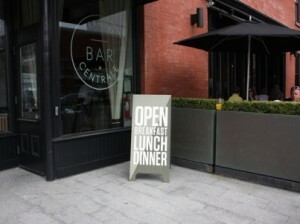 Winning venue, with one of the top 10 patio in downtown Toronto. It has this particularity of having 2 patios! On the ground floor you can find a large space featuring 3 fountains. Facing south, the patio is filled by sun all day. A good time to enjoy a family brunch drinks with friends. Hair of the dog is also a dining experience where you can enjoy fine food in cozy and more intimate spaces. Fun fact: Hair of Dog has been voted best place to have a first date. And awarded great place to dump someone by the staff! Situated at 25 Dockside Drive on Corus Quay, right next to Sugar Beach, the patio has a spectacular view of Lake Ontario, the Harbour and Toronto Island. It comfortably seats 180 guests around traditional two tops, beach like lounge areas and umbrellas for this hot summer. Every weekend, from 10.30 a.m. to 3 p.m., the restaurant offers $5 Bloody Caesar specials and during the week you will be able to enjoy unique local and European brews, interesting new and old world wines and some amazing cocktails. Amsterdam Brewhouse has recently opened a newly renovated, 14, 000 square foot craft brewery, restaurant and retail venue in the heart of Toronto’s waterfront. 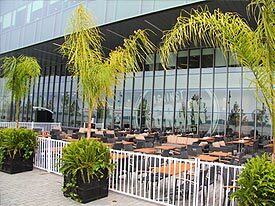 Situated at 245 Queens Quay West, the venue can accommodate up to 500 in its rustic urban interior, and offers an additional 300+ on the spacious lakeside patio, for a total capacity of over 800 guests. 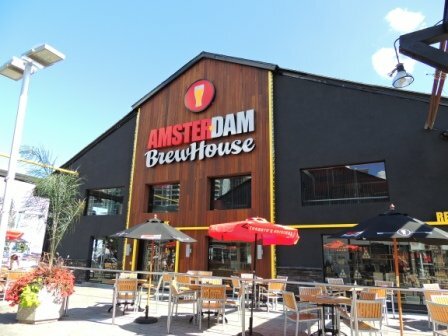 AMSTERDAM BREWHOUSE features a bar/lounge, a dining room, several patios, a state of the art AV system, authentic wood burning oven, a working craft brewery and full retail store, all to be open 7 days a week. 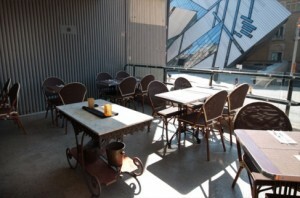 In the Rosedale community one of the best patios to relax on would be at the Terroni Bar Centrale. This patio is a great way to enjoy the homey designed feel of Italy. With a vast selection from the “tapas style” menu plates are intended to be shared, which is the perfect scenery for a hang out spot with friends and family. Also, this wine bar has a signature selection of Terroni-exclusive wines and a unique variety from Italy. Experience a day or night on the patio laughing, sharing and appreciating the summer days. Enclosed with fresh greenery this patio gives off a natural blissful vibe. The Terroni Bar Centrale’s patio is a great way to retreat for some time of relaxation. After a long, hot summer day finding a patio that is just right could be difficult to find, but look no further because Museum Tavern Toronto has that just right patio. With a slight summer breeze and nice view this patio is to die for. Facing the ROM you can enjoy the menu from executive chef Steven Gouzopoulos which features all-American classics with a twist. Not to mention the Moses McIntee’s drinks list that is a temptation you cannot resist. Enjoy the last moments of summer on the restaurant’s second floor terrace, an experience you will not regret. The Beer Hall is the new space of the Mill Street Brew Pub situated in the Distillery District. Opened in April this year, this place offers a modern and lively atmosphere where it is pleasant to enjoy a good beer with friends or simply an excellent meal. 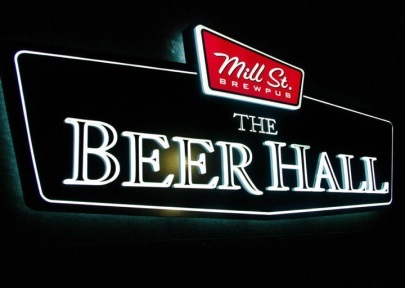 With its open concept kitchen offering local and international cuisine, a heated, a cover patio and communal seating, The Beer Hall is the perfect place to welcome group events from 15 to 500 persons. Also, don’t forget to try the bierschnaps, a traditional German Beer-based spirit, which is only served at Beer Hall. Hosted by Toronto Special Event Network and CityEvents, this 4th event of the year will focus on inspiration and the unstoppable drive every successful event professional possess. 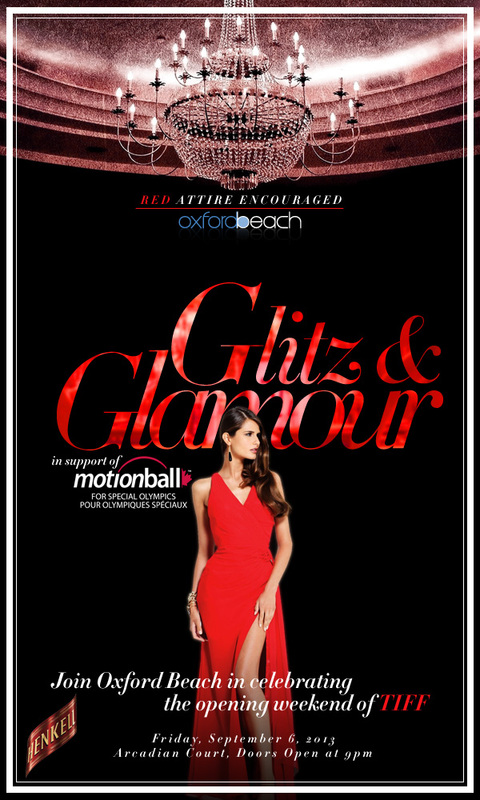 Oxford Beach’s 4th annual film fest opening night party, this year in support of motionball for Special Olympics Canada, is on Friday September 6th! The beautiful Arcadian Court & Loft will set the backdrop for a red hot evening featuring awesome DJs, cupcakes by Bite Me Bakery and a cash bar. The dress code is semi-formal and red attire is encouraged.